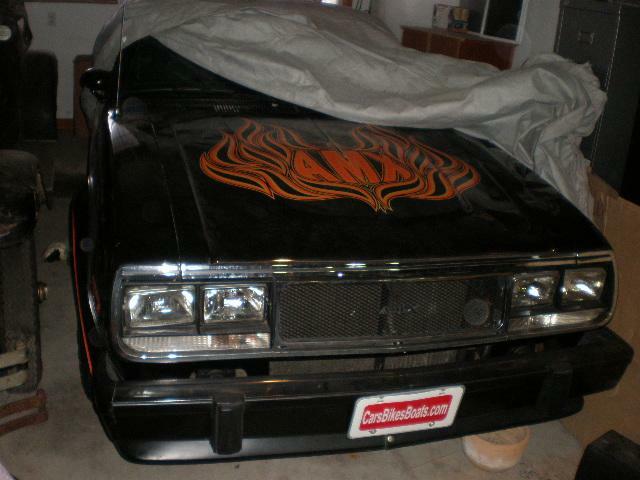 1979 AMC AMX with 2,182 actual one owner miles, and of course a story... When was the last time you saw a 79 AMX?? Back in the day, you could put a dime in a gumball machine and get a Camaro or Mustang, but you seldom saw one of these little Hot Rods, and with its 304 V-8 and four speed, it was about as peppy a ride as you could buy in 1979. This car was given to a young man as a graduation present. He passed away shortly afterwards and the family kept the car covered in a heated garage for the next 28 years. His dad and brother pulled it out and waxed it, armour-alled the tires,(including the backside and the tread), and drove it around the block a few times over the years. It is literally a new car. I have had low mileage cars before, but never one as untouched as this one. It has never been rained on. The paint hasn’t been all polished off, the decals are bright and shiny, the interior still has a new smell. The origional white lettered tires are still like new and not cracked. It still has the glue on the window from the window sticker, which is still with it along with all of the original paperwork from new, ($6,812 out the door). It is still sporting it’s last inspection sticker from 1981 with 1872 miles showing. I installed a new battery and fuel pump, fresh gas, changed all of the fluids, and it runs and drives like a new 1979 AMX. It needs to find a good home, preferably a museum where it could be enjoyed by many. Too Late again, SOLD, and It is off to Alberta Canada with Hienz who coincidently bought one just like this off the showroom floor in 1979.